Potash Ridge Corp. has released an update to the independent NI 43-101 Prefeasibility Technical Report (the January 2017 PFS) for the company’s Blawn Mountain Project in Utah, dated 18 January 2017. "Potash Ridge Corp. releases prefeasibility technical report "
The January 2017 PFS assumed the production of 232 000 tpy of potassium sulfate together with a by-product sulfuric acid from 153.3 million t of proven and probable alunite reserves. Alumina-rich material was assumed to go into tailings. 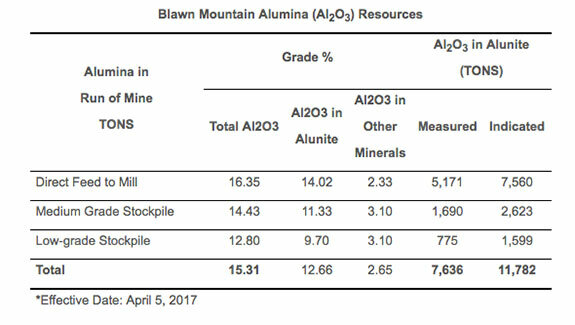 This updated NI 43-101 Prefeasibility Technical Report (the April 2017 PFS) includes Resources for the alumina from alunite contained in the tailings and was prepared by Millcreek Mining Group and Resource Development Inc.
Based on the April 2017 PFS, Blawn Mountain contains 19.4 million t of measured and indicated alumina Resources contained in the alunite ore. The United States Geological Survey reports that in 2015 bauxite, which is 50% alumina and 50% other materials, sold for US$28/t in the United States, while processed alumina sold for US$410/t. Alumina contained in the alunite ore is presently not considered a Reserve. The above table presents the Measured and Indicated alumina Resources contained within the alunite ore that will be used to produce SOP and sulfuric acid. The resources shown above exclude alumina (Al2O3) contained in non-alunite material that will be mined as part of extracting the alunite for processing, and which will be included in tailings. Following the release of the January 2017 PFS, several parties approached the Corporation to explore potential applications for the alumina-rich residue material, including as a binding agent in the production of concrete, a raw material for the production of aluminium with a much smaller environmental footprint than bauxite, and other industrial applications. Commercial discussions are currently aimed at determining the optimal product mix. Based on the mine plan in the April 2017 PFS, 19.4 million t of pure alumina will be placed in the tailings over the 46-year project life, representing approximately 420 000 tpy of pure alumina from alunite going into the tailings. Based on the recommendations from the April 2017 PFS, Potash Ridge intends to undertake additional metallurgical testing to determine the most economic means to extract alumina from the residual waste material. "Blawn Mountain is already a world-class SOP fertilizer project, with a long project life and very low operating costs," stated Guy Bentinck, CEO. "The realisation of market demand for the alumina contained in our tailings provides tremendous value upside potential and diversity to our revenue stream."